Bell peppers and onions are commonly used ingredients in many recipes, and when celery is added, it is referred to as a mirepoix, a mainstay of classic French cooking. 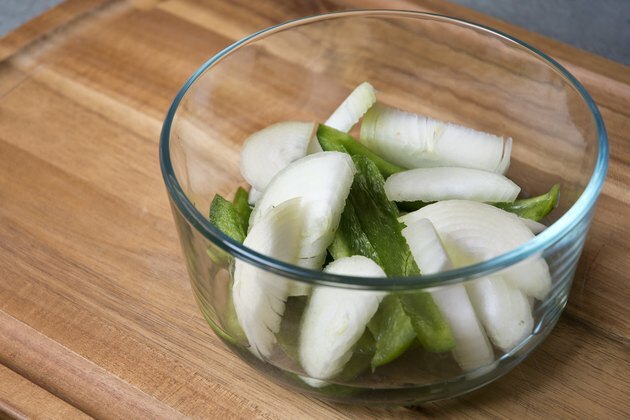 Cooking bell peppers and onions in the microwave ahead of time is beneficial for many people, whether you're just out of burners on the stove because of a large meal or you don't have time to do all the preparation work before every meal. 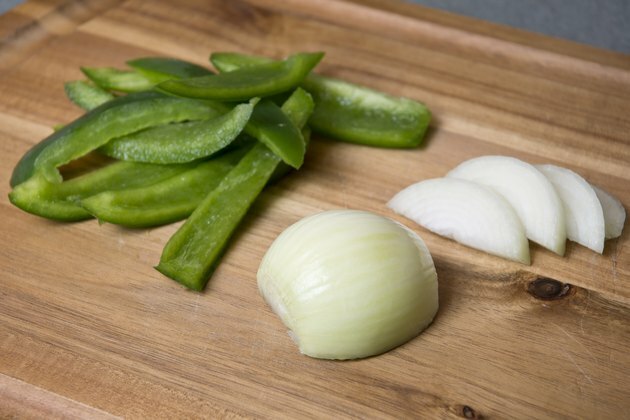 Before you can cook bell peppers and onions in the microwave, you need to prepare them for cooking. Wash the bell peppers under cool water from the tap, gently scrubbing them with your fingers to remove any excess dirt. Cut the top stem portion of the bell pepper off and discard it. Remove the white ribs on the inside of the bell pepper and slice it into strips approximately 1/4 inch thick. To prepare the onion, remove the top and bottom portion with a sharp knife, and peel the skin and first layer of the onion off. Slice the onion into slices approximately 1/4-inch thick. 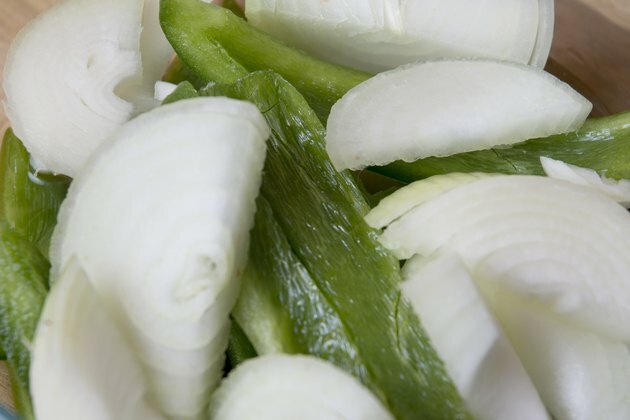 Steaming bell peppers and onions is a simple, quick way to make a side dish or part of a warm salad for a healthy meal. To steam them, place the onion and peppers in a baking dish large enough to easily hold them and add about 1/8 cup of clean water or chicken or vegetable stock or broth. Cover the container with microwave-safe plastic wrap, and poke a few holes in the plastic wrap with the tines of a fork to allow the steam to escape. Microwave the bell peppers and onions for five to six minutes, stirring the peppers and onions about halfway through the cooking time. If you're microwaving bell peppers and onions to recipes like pasta sauce or meat dishes, you can use a thicker liquid or oil to flavor the bell peppers instead of using plain water or broth. For example, you can use 1/8 cup of tomato sauce instead for pasta sauce recipes. 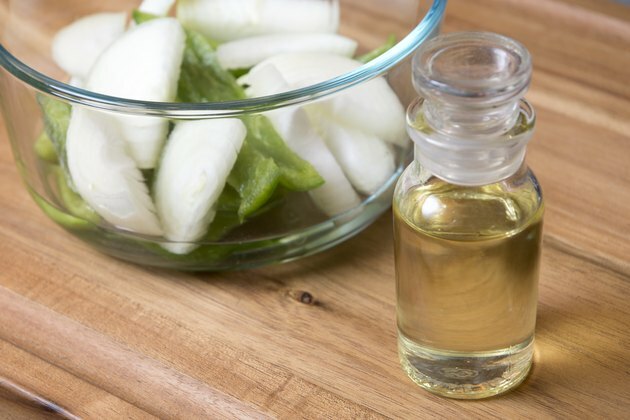 If you want to use oil for dishes like sauteed chicken, fish or meat, use a little less than 1/8 cup of olive oil to cook the bell peppers and onions. Cooked bell peppers are convenient for busy cooks who don't always have time to do all the preparation work before every meal, especially if you're feeding a large family or group every day. 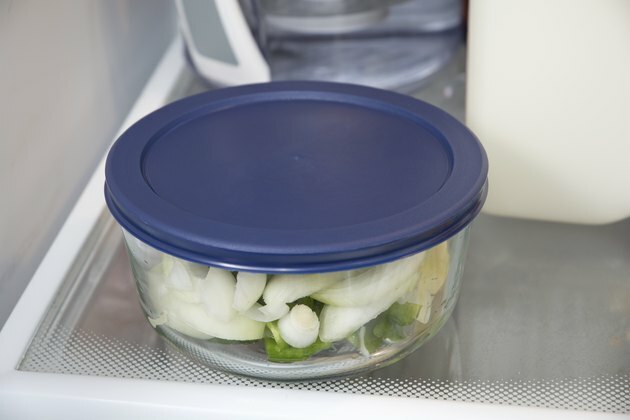 Microwaved bell peppers and onions can be stored in an airtight container in the refrigerator for about 72 hours before they are discarded. After 72 hours, the vegetables will start to soften to an undesirable texture and unhealthy bacteria can begin to form on them.